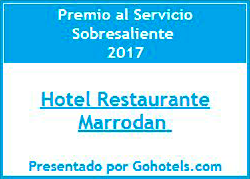 In the Marrodán Hotel we want you to enjoy the region and also the relax that can be spotted in our hotel, but always at the best price. That’s why we have varied offers; keep updated of our exclusive discounts and get the best price at any time of the year. Booking at least 2 nights through our official website you will benefit from a 5% discount. If you stay with us for more than three days or you are travelling in a group, get in contact with us so we can inform you of our special offers. You can contact us by email: hotel@hotelmarrodan.es or by telephone: +34 941 39 40 04. Benefit from a 10% discount at this famous paleoadventure park located in Enciso, a town declared Biosphere Reserve by the UNESCO, where thousands of dinosaur footprints have been discovered. The park is the perfect place to spend a fun and educative family time thanks to a wide offer of activities (pools, adventure circuits, climbing walls, 3D cretaceous museum...). Come to Hotel Marrodán and enjoy a relaxing experience. For booking, contact directly with the hotel. If you are planning on staying at least three nights only by booking thorugh our official website you can benefit from a special 10% discount. Do you want to spend some romantic days in a wonderful region? We have this special programme for you, so you can enjoy your trip to Arnedillo with your couple. We will have everything ready so those days are unforgettable. -	Two nights accommodation with breakfast. -	Wine bottle in the room. -	Room decorated for the occasion. -	Check-out at 14:00h (subject to availability). Price for two people: 99€ (VAT included). Book your stay and write us to hotel@hotelmarrodan.es. Release stress and treat yourself at a unique price. 1 day of dinner (water and wine included): SALAD OF THE HOUSE. LAMB RIBS WITH POTATOES, HOMEMADE DESSERT TO CHOOSE. 1 day of full access to the spa, with mineral-medicinal water pool, jacuzzi circuit, underwater jets and bubble pool. To book, get in contact with the hotel.